The school follows: EYFS in Foundation Stage, CPP in Years 1 to 6 and The National Curriculum For England in Years 7 and 8.The school’s curriculum is designed keeping in mind the multicultural mix of the student community and their individual learning needs. Based on the National curriculum pattern it aims to ensure that excellence is pursued, that lessons are challenging and have pace and direction to promote the skills essential for all round development of each child. As the students move to the upper classes, the day becomes more structured. 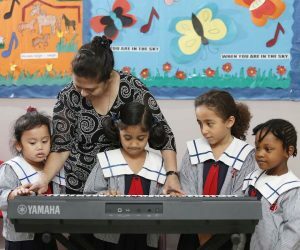 The full range of National Curriculum subjects is taught and greater specialization is introduced. Progress is carefully monitored through assessments and examinations. Individual strengths of students are identified to motivate optimal use of their potential. They are encouraged to discover new horizons of excellence and also enjoy the experience. Apple- ites are encouraged to discover new areas of excellence and to enjoy the experience! In addition to their academic achievements, it is our aim that they should leave us equipped with the skills that will enable them to succeed in an ever- changing world. Apart from academics, Apple-ites are identified and trained and encouraged to cultivate leadership qualities at all stages of learning. They are given a platform to voice their opinion and share responsibility in the school improvement and development through the school prefectorial board. Head Boy, Head Girl, House Captains, Vice Captains, Sports Captains, Student council members and Prefects are elected from Year 4 – 8 and they swear in to perform their duties with diligence and responsibility for the school’s progress and also to be role models for their peers. It enhances in them a sense of belonging towards the school and a commitment towards society at large. Underpinning our strong academic programme is our belief in a holistic education. One of our prime values is the development of leadership. Monitors: Every class in the Junior School has a system of Monitors who are appointed on a rotation basis. This provides students an opportunity of assuming responsibilities. The school follows the ‘Ginn Reading Skills Programme.’ Every week two periods are set aside for enhancing Literacy Skills. 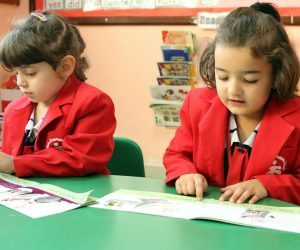 Every child reads at his/ her own pace of the Reader Level and then completes the corresponding Work- book and Reading Skills book. A good reader may finish up to 3 levels in a year. Numeracy skills are incorporated into the curriculum. Mathematics is not just a subject that needs to be solved on paper. The problems are application based to help improve the critical thinking skills of students.